Ukraine putschist authorities are illegitimate. Arsen Avakov is interim interior minister. On Thursday he lied. He pointed fingers the wrong way. He outrageously accused Ukraine’s legitimate President Viktor Yanokovych, his interior minister Vitali Zakharchenko, and Russian security elements of direct involvement in Kiev sniper shootings. “The former government of the country gave criminal orders and a huge number of people suffered in the ‘mincer’,” he said. He cited no evidence whatever proving it. None exists. He said a dozen Ukrainian so-called Black Unit Berkut police officers were detained on suspicion of what happened. Its officers complained about neo-Nazi provocations. They and their families were threatened. They’re “now being thrown to the gang of nationalists…” They deserve better than they got. They had no involvement in sniper shootings. Their own ranks were targeted. Putschist snipers shot them from occupied buildings. They killed them. At the time, they were doing their job with restraint. They’re heroes, not villains. Clear evidence shows Kiev putschists recruited Euromaidan snipers. They bear full responsibility for what happened. Claims otherwise are lies. More on this below. Illegitimate Security Service of Ukraine (SBU) Valentyn Nalivaichenko head lied. He claimed Russian Federal Security Service (FSB) elements collaborated with Yanukovych’s security service SBU authorities in December and January. Russian citizens were present at SBU headquarters, he alleged. Moscow delivered explosives and weapons to Kiev, he claimed. (Phantom) planes loaded with over 5,000 kilograms of Russian explosives and other materials delivered them, he said. “They brought the means of organizing the shooting and destruction of our protesters on Maidan,” he added. No corroborating evidence was cited. None exists. Outrageous charges have no legitimacy. Avakov turned truth on its head. Lies substituted. On Thursday, illegitimate putschist prime minister Arseny Yatsenyuk outrageously accused Yanukovych of direct involvement in planning Kiev sniper shootings. 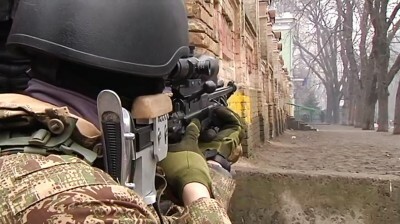 Russia categorically denied sniper shootings involvement. Foreign Minister Sergei Lavrov was clear and unequivocal. He cited hard evidence showing putschist Right Sector responsibility for what happened. “(A) good deal of facts…point to” this conclusion. Moscow informed Western authorities, he said. “(S)weep(ing) (truth) under the rug” is unacceptable. Substituting lies is worse. Kiev authorities ignored hard evidence, said Lavrov. Legitimate investigation into what happened was whitewashed. Independent analysis was ignored. Kiev authorities turned a blind eye to Estonian Foreign Minister Urmas Paet’s comments. On February 25 , he and EU foreign policy Catherine Ashton spoke. They were monitored. They didn’t know it at the time. Their discussion was leaked. Paet commented on what he heard in Kiev. Around 100 people were killed. Another 900 were injured. Paet blamed putschists for cover-up. They refuse to investigate, he said. They want evidence suppressed. Snipers were neo-Nazi hitmen. Yanukovych and others in his government had no involvement. On March 12, former Ukrainian Security Service head Aleksandr Yakimenko confirmed Paet’s assessment. He blamed putschist official Andrey Parubiy. He’s a neo-Nazi Svoboda party leader. Moscow wants an independent investigation. It wants full disclosure of what happened. Deep East/West divisions remain. Russia and independent analysts are on its own to investigate. Evidence revealed will be buried. Ukraine’s dark future is planned. It remains to be seen how ordinary Ukrainians react. Perhaps Euromaidan protests 2.0 will follow. The battle for Ukraine’s soul continues. On Thursday, Russia’s Federal Security Service (FSB) said 25 ultranationalist Ukrainians were detained. They’re held on suspicions of planning terrorist attacks in seven Russian regions. They include Rostov, Vogograd, Tver, Orel, Belgorod regions, as well as Kalmykia and Tatarstan republics. They admitted intentions to do so. They said Ukraine’s SBU sent them to photo survey Russian military exercises. They were told to establish contacts with Russian radicals. They were detained “before committing any illegal actions damaging Russian security,” the statement added. At least three Right Sector members were involved. Expect similar provocations ahead. Washington’s dirty hands are likely involved. Confronting Russia irresponsibly continues. A US navy warship was deployed to Black Sea waters. Pentagon authorities didn’t confirm what vessel was sent. Two US destroyers are nearby – the USS Donald Cook and USS Ramage. They’re involved in eastern Mediterranean exercises with Greek and Israeli navies. US naval forces operate provocatively in Black Sea waters and others nearby. Lavrov criticized Pentagon deployments responsibly. They violate Montreux Convention provisions, he said. It’s a 1936 international agreement. It restricts naval warships’ passage through the Bosporus Straits and Dardanelles. It pertains to non-Black Sea area nations. Washington ignores international laws, conventions and treaties. Its own rules alone apply. It does what it wants. It operates extrajudicially. Escalating tensions threaten potential conflict with Russia. The worst of all possible outcomes could follow.